One of our users Atul Karmarkar has written a very in-depth review of MProfit and other portfolio management tools on his blog. 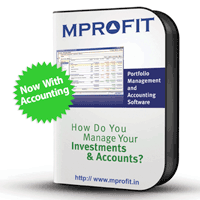 A year ago, I’d tried MProfit Portfolio Management – it was then available on a trial basis, after which one had to pay. I liked it, but wasn’t sure about paying for something that MS Money and the ET Tracker were doing for free. Some months ago however, it was made available for free for investors (for investments upto Rs.50 lakhs) and I downloaded it again. It is desktop based and all data is stored locally, so being online isn’t a must. Data is updated real time to the extent allowed (with the standard 15 minute delay). There isn’t much to configure and once that was done, I went about adding data. The opening screen has a list of investment types on the left, from which one can select the required type and input the details. It is fairly straightforward and… the full review is available on his blog.